Biofuels are organic fuels that are grown. The most common biofuels like corn ethanol compete with food for scarce agricultural land. More advanced algae-based biofuels may allow us to grow much of our fuel. Using plant and animal biomass to fuel vehicles may sound like a new concept, but the technology dates back as far as the 1820s, when American inventor Samuel Morey used ethanol and turpentine to power an internal combustion engine. Later that century, Rudolph Diesel fueled engines with peanut oil. Henry Ford's Model T was calibrated to run on a range of ethanol/gasoline blends at the beginning of the 20th century, but soon after the market was flooded with cheap petroleum fuels that overshadowed biofuels. Ethanol fell off the radar until the oil crises of the 1970s. Invented, forgotten and revived by necessity, so goes the story of biofuels. It was in response to soaring oil prices that countries like Brazil and the United States launched fuel ethanol programs to avoid importing oil. Other countries like China, Kenya, Zimbabwe, and European countries, Germany chief among them, embarked on similar programs. In recent decades the drive to reduce greenhouse gas emissions have encouraged an expanding biofuels industry, concentrated mainly in Brazil, the US, Europe, and Canada. It is generally agreed that emissions levels of biofuels are less than those of fossil fuels, though by how much is a matter of debate. The emissions reductions (from as little as 7% in one study, to as high as 80% in another) are a tradeoff for the range of environmental and social consequences of increased biofuels use. Problems like food scarcity, rising grain prices, deforestation, and the loss of global biodiversity are closely intertwined with biofuels. Because of these, biofuels are not the straightforward solution to climate change that many had hoped them to be. The outlook for biofuels is complex. With current practices, and corn dominating as a feedstock for ethanol, biofuel technology can be extremely destructive to humans and the environment. Measures to address the "food versus fuel debate" include advancements in next generation fuels (non-food fuels) like algae and cellulosic fuel crops such as switchgrass. Though promising in many regards, there is no certainty as to when, or if, these technologies will develop to a point where they become cost effective. Worldwatch Institute. 2006. Biofuels for Transport: Global Potential and Implications for Energy and Agriculture. Prepared by Worldwatch Institute for the German Ministry of Food, Agriculture and Consumer Protection in coordination with the German Agency for Technical Cooperation and the German Agency of Renewable Resources. Earthscan. London. Natural Resources Canada. 2010. Next-generation biofuels. Alternative Fuel Facts. Retrieved at: http://oee.nrcan.gc.ca/transportation/alternative-fuels/programs/next-gen-fund/next-gen-biofuels.cfm?attr=8. Yacobucci, B. 2009. Fuel Ethanol: Background and Public Policy Issues. Ch 2. Ethanol and Biofuels Production, Standards and Potential. Ed. W. Leland. Nova Science Publishers. New York. The Costa Pinto sugarcane and ethanol production plant near Sao Paulo, Brazil. Biofuels are derived from biomass (recently living organisms) commonly produced from plants, animals and microorganisms, but also from organic wastes (the metabolic byproducts of animals). Fossil fuels also use once living material; however, the distinction is that biofuel uses recently living biomass, while fossil fuels use ancient biomass that has chemically altered to its current state. When used to generate energy, biomass is considered carbon-neutral because it releases no more carbon into the atmosphere than the organism absorbed in its lifetime. As a result, bioenergy is seen as a way to reduce the amount of new carbon dioxide released into the atmosphere when it replaces non-renewable sources of energy. The term biofuel encompasses solid biomass, liquid fuels and biogases. The following section offers a description of how various materials are used in the three main types of biofuels: ethanol, biodiesel and biogas. Let's begin with ethanol. Similar to the process of winemaking, ethanol production involves the fermentation of starchy, sugar filled food (corn, grains, potatoes) to create alcohol. 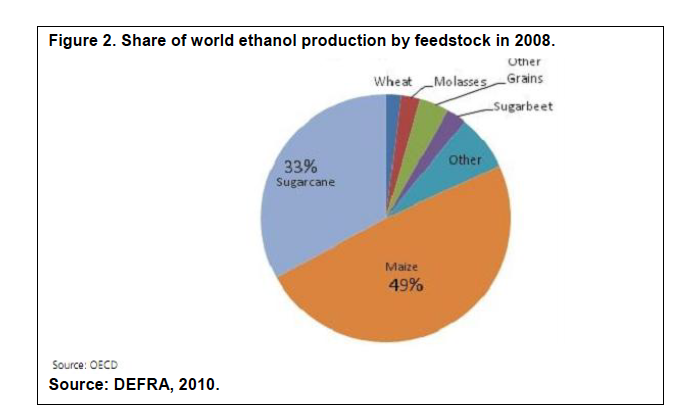 Maize (corn) is the most important ethanol feedstock, though sugarcane is catching up. Ethanol is primarily used as transport fuel in vehicles. A blend of 10% ethanol and 90% gasoline is known as E10, or "gasohol." E10 Unleaded is the most common blend of ethanol and gasoline and is approved by every major automobile maker for use in their vehicles. The ethanol used in E10 is highly distilled and dehydrated to produce a high-octane, water-free alcohol, because water mixtures cannot be dissolved into gasoline. More than 50% of the gasoline that is available in the United States today contains at least 10% ethanol. Most of this is E10 Unleaded. In Canada there are a large number of service stations where E10 fuels can be purchased; some commercial vehicle fleets are even now exploring an E15 blend. It should be noted however that ethanol blended fuels are not recommended for vehicles manufactured before the 1980s. E85, a ratio of 85% ethanol to 15% gasoline, pushes the blend even further and is rapidly becoming a major player in the alternative fuel marketplace of the United States. This ethanol heavy fuel can only be used in flexible fuel vehicles (FFVs), which are specially designed to run on gasoline, E85 or any combination of the two. Just like all ethanol blends, the lower energy content means E85 results in about 25-30% fewer miles per gallon. 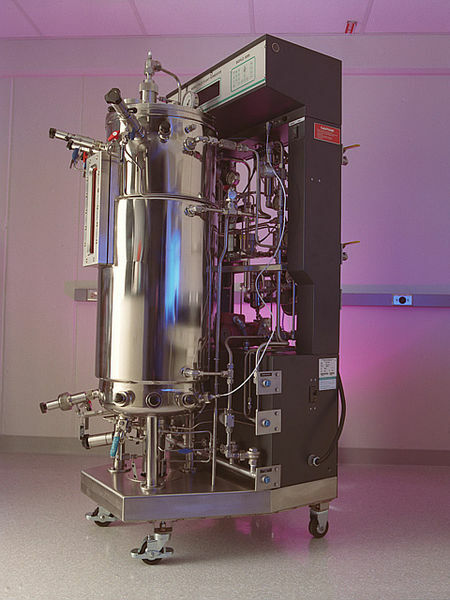 An experimental bioreactor which ferments biomass and produces cellulosic ethanol. by the U.S. Department of Energy. The use of ethanol-diesel fuel blends are growing around the world, and are designed to provide renewable, cleaner burning fuel alternatives for off-road equipment, buses, semi-trucks and other vehicles that run on diesel fuel. With the addition of ethanol and other fuel additives to diesel, the characteristic black diesel smoke is eliminated and there are significant reductions in particulate matter, carbon monoxide, and nitrogen oxide emissions. It is also possible to use ethanol for cooking as a replacement for wood, charcoal, propane, or as a substitute for lighting fuels, such as kerosene. Cellulosic biomass is becoming an appealing surrogate for the more conventional edible feedstocks, like maize and sugarcane. It is the argument as to which aspects of biomass should be used in biofuels production that has created the food versus fuel debate. New technologies use processes like cellulosic hydrolysis to convert cellulose to ethanol. The use of cellulosic feed stocks is still in the early stages of technological development. Although there are more plentiful and readily available sources of cellulosic biomass than traditional feedstocks such as corn, the conversion process remains both extensive and costly. Many ethanol producing facilities are running test projects with cellulosic biomass, including a bioenergy corporation, Iogen Corp., in Ottawa, Ontario. Biodiesel is a non-toxic, biodegradable, and renewable fuel converted from oils (such as canola and soy oils, animal fats, recycled cooking oils and restaurant waste grease). Research is underway to determine if the oils from algae could be used for the development of biodiesel. In a process called transesterification, the oil is brought into contact with an alcohol, like methanol, and a catalyst, like sodium hydroxide resulting in the production of glycerine and the result we call biodiesel. Biodiesel can be used in its pure form (B100) in place of conventional diesel, or blended with it, in forms like B2 (2% diesel), B5, or B20, all of which most diesel engines are able to run on. Similar to ethanol diesel, biodiesel has a higher cetane rating, which can improve starting and reduce black smoke emissions. Developed from animal and or plant biomass with a lifecycle of a few years, biodiesel reduces emissions of harmful greenhouse gases, smog and acid-rain causing particles emissions, and carcinogens. Biogas is mostly methane (natural gas) and carbon dioxide. The required methane can be taken from landfill gas, sewage sludge gas, corn silage or liquid manure. The main ingredient for biogas production is called the feedstock, and may include manure, sewage sludge or food waste. The feedstock is then pre-processed in some way, either by simply mixing to create a homogenous substance, or with complex processes (like hydrolysis and micronyzation) to maximize the production of biogas. The prepared feedstock is then introduced to anaerobic digesters -- microorganisms that break down biodegradable matter in the absence of oxygen. The first digester converts the fats, carbohydrates and proteins in the organic matter into simple acids like acetic acid and carbon dioxide. Then, a second type of digester changes the acids into methane and carbon dioxide. This gas mixture is then collected and used as fuel. Biogas in Canada has a wide range of potential applications, at sites like landfills, municipal wastewater treatment facilities, and farm-based operations, as well as in municipal solid waste (MSW) digestion, the pulp and paper industry, and the food and beverage industry. First generation biofuels are produced with conventional technologies and conventional feedstocks such as seeds, grains or whole plants that are also food sources. First generation feedstocks include: corn, sugarcane, wheat and other grains. Second generation biofuels offer the possibility of using non-food sources as feedstocks. Such materials include: waste biomass, the stalks of wheat, corn stover, wood, and special energy crops like Miscanthus. The technology involved in this branch of biofuels is called BtL (Biomass to Liquid). Products under development include: biohydrogen, biomethanol, DMF, Bio-DME, Fischer-Tropsch diesel, biohydrogen diesel, and mixed alcohols. This technology is not yet cost comparative to first generation biofuels. Third generation biofuels are the newest category of biofuels. The most significant feedstock for this type is algae. Algae is cultivated for the production of triglycerides to produce biodiesel, in much the same way as biodiesel is produced with second generation feedstocks. Second and third generation biofuels are also called advanced, or next-generation biofuels. BC Bioenergy Strategy. 2010. Retrieved at: http://www.energyplan.gov.bc.ca/bioenergy/PDF/BioEnergy_Plan_005_0130_web0000.pdf. Natural Resources Canada. 2011. Ethanol. Alternative Fuel Information. Retrieved at: http://oee.nrcan.gc.ca/transportation/alternative-fuels/fuel-facts/ethanol/about-ethanol.cfm?attr=16. U.S. Department of Energy. 2011. Ethanol. Energy Efficiency & Renewable Energy. U.S. Environmental Protection Agency. Retrieved at: http://www.fueleconomy.gov/feg/ethanol.shtml. Sissine, F. 2009. 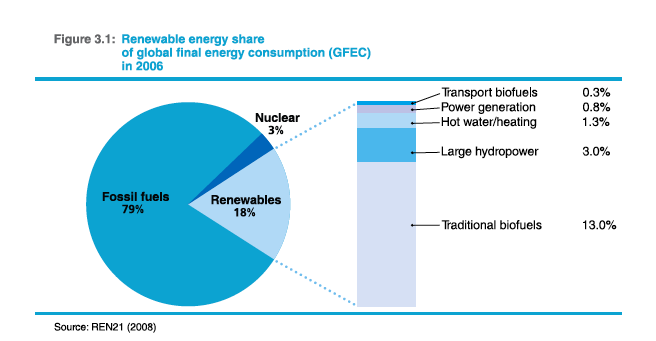 Renewable Energy: Background and Issues for the 110th Congress. Ch 1. Ethanol and Biofuels Production, Standards and Potential. Ed. W. Leland. Nova Science Publishers. New York. De Castro, Julio. 2007. Biofuels -- An overview. Retrieved from: http://www.biofuel-africa.org/2007/IMG/pdf/Biofuels_Final_Report.pdf. First generation feedstocks are generally best cultivated in agricultural regions where there's an abundant supply of water. Presently, corn production for ethanol is focused in the US's fertile Corn Belt, and sugarcane production for ethanol is in Brazil. Many African countries also cultivate feedstocks including corn, sugarcane, molasses, and grains. Biofuel feedstocks, particularly corn for ethanol, require large amounts of land. One report claims that "U.S. gasoline consumption was 134 billion gallons in 2003. It would take more than 546 million acres of U.S. farmland to replace all of our current gasoline use with corn ethanol." Other energy experts affirm that if we were to replace all fossil fuels with biomass energy, we would need twice as much farmland than exists on earth. Land for biofuel production is expected to come from the conversion of forests into agricultural land. Biofuel develpoment means pasture lands and multi-crop farms have already begun transforming into huge sugarcane monocultures in Brazil. The effect on animal habitats are extremely detrimental. Further, deforestation could affect the hydrological cycle and the climate, reducing rainfall and causing rising temperatures. The planet's forests also act as important "sinks" for absorbing carbon dioxide, the primary greenhouse gas. Cutting them down has the same climate impact as burning fossil fuels. Humanity is already failing to achieve a sustainable balance between farmland demand and forests. Biofuels are only helping to tip the scales in the wrong direction. Biofuel development is being accelerated through mandates, subsidies, and favourable trade policies across the globe. Canada is enforcing a new mandate for an average of 5% ethanol in gasoline sold since late 2010. A mandate for an average of 2% biodiesel content in diesel distillates was implemented on July 1, 2011. If Canada aims to support these mandates with domestic production, rather than relying on imports it will have to boost production of ethanol by 7%, and biodiesel by 450%. The federal government has said that the combined fuel requirements will reduce greenhouse gas emissions by up to four megatonnes -- the equivalent of removing one million vehicles from the road. 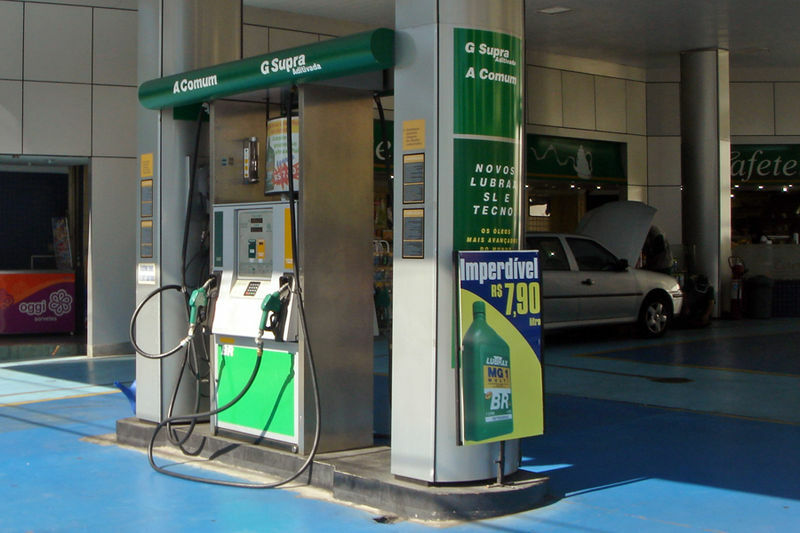 An ethanol-gasoline dual use petrol station pump in Brazil. The cheapest ethanol production is in Brazil, where a combination of readily available resources and cheap labour makes prices of about $0.20 per litre possible. Grain-based ethanol can cost up to 50% more to produce in North America than this Brazilian cane-based fuel. A major factor is contrasting wages; an average Brazilian worker in the cane industry made $3.03 per hour in 2005, while their American counterparts raked in $23.17. In addition, feedstock prices go from as little as $0.08 per litre in Brazil, to $0.24 in the US. Part of what governs feedstock cost is the amount of fertilizer required. Sugar cane plantations use about 57 lbs of nitrogen per acre, while corn needs 130 lbs to achieve profitable results. Cellulosic feedstocks like switchgrass are poised to take off if technology can streamline the conversion process. Cellulosic feedstocks like switchgrass are poised to take off if technology can streamline the conversion process. However, a study by the Center for Agricultural and Rural Development at Iowa State University concluded that farmers would not be willing to shift to dedicated cellulosic crops unless they offered net returns comparable to that of corn. The current view is that cellulosic crops like switchgrass cannot offer farmers the same incentives as maize can, unless they receive substantial subsidies. The biodiesel industry has lagged behind ethanol due to the high cost of vegetable-based oils for feedstocks. When combined with the relatively low price of petroleum diesel the biodiesel industry has another large hurdle to overcome. Feedstocks alone can account for 70% of the manufacturing costs, which has historically rendered it more expensive than petro-diesel--in some cases costing twice as much. But with the recent increases in petroleum prices, and supportive tax and production incentives, biodiesel is now becoming cost competitive with petro-diesel. Waste oils also have a limited availability so unless advances are made in the use of next-generation feedstocks such as algae, biodiesel will only be able to progress so far. In the 2004 budget, the Province of British Columbia amended the Alternative Motor Fuel Tax Act, allowing the biodiesel portion of a biodiesel blend to be exempt from the provincial motor fuel tax. Although biodiesel is not yet being manufactured commercially in BC, it has one of the largest markets for biodiesel in the country. The production of biofuels motivates a large number of jobs in the agricultural sector, the agro-industrial sector (concerned with distillation and processing of by-products), the commercialization of new market commodities, and in new product manufacture. It is predicted that this range of employment would drive up incomes, especially in rural areas. This could potentially lead to enhanced opportunities for education and health care in the developing world where many feedstocks are cultivated. The anticipated rise of cellulosic biomass could have negative effects on the world's corn growers. If cellulosic feedstocks become the new demand, farmers' investments in corn ethanol would be destroyed. Additionally, cellulosic crops cannot offer farmers the same profits earned from maize production, unless sufficient subsidies are incorporated. The production of biofuels has two things in common with the production of food: demand for land and water. Food and fuel are two things humans consume a lot of. Both can be seen as necessities, though we have had many types of fuels throughout human history. As the global population continues to grow, we face a growing demand for both food and fuel. At the same time we need to limit the emissions of the pollutants known to drive climate change. The world's consumption of food and fuel is inextricably linked to our environmental problems and solutions. Biofuels present an opportunity to address the epochal challenge of anthropogenic climate change. But will GHG emissions reductions come at the cost of our food supply or our forests? 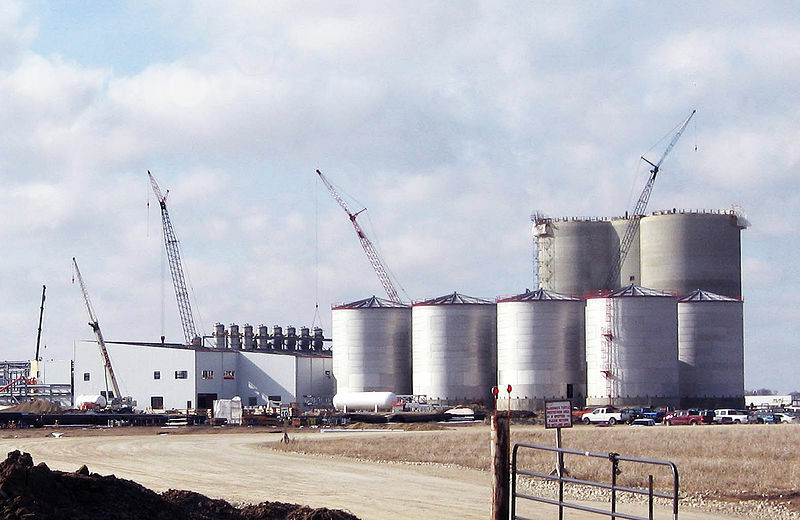 An ethanol plant under construction in Iowa. Growing demand from biofuel producers has been proven to affect the price of associated grains, especially corn. Additionally, farmers are converting diverse crop lands to mono-crop farms because fuel crops are often more lucrative than food crops. Already in Brazil, orange plantations are in major decline as sugarcane production increases. Farmers are cutting down tropical rainforests and converting them into land for valuable fuel crops. Cellulosic biomass, as the name implies, is full of cellulose. Cellulose is fibrous and cannot be directly fermented. Instead, manufacturers must first break it down into usable molecules. A study conducted in 2000 found that production costs increased by 70% when ethanol production was switched from corn to cellulosic biomass. Until the technology exists such that the use of cellulosic feedstocks is financially feasible there will continue to be competition between the markets for food and fuel. Taylor, S. 2011. Canada proposes July 1 start for biodiesel rule. Reuters. Ed. Frank McGurty. Retrieved at: http://www.reuters.com/article/2011/02/10/canada-biodiesel-idUSN1021406220110210. Daynard, Karen. ,Daynard, Terry. 2011. What are the effects of biofuels and bioproducts on the environment, crop and food prices and world hunger? KD Communications. Retrieved at: http://gfo.ca/LinkClick.aspx?fileticket=HKfOeU3cHTI%3d&tabid=793. Steenblink, Ronald. 2007. Biofuels -- At what cost? Global Subsidies Initiative. Geneva, Switzerland. Retrieved at: http://www.globalsubsidies.org/files/assets/oecdbiofuels.pdf. Tokgoz, S., A. Elobeid, J. Fabiosa, D. Hayes, B. Babcock, T. Yu, F. Dong, C. Hart, J. Beghin. 2007. Emerging biofuels: Outlook of effects on U.S. grain, oilseed, and livestock markets. Staff Report 07-SR-101, Center for Agricultural and Rural Development, Iowa State University. Ames, Iowa. Retrieved at:http://www.card.iastate.edu/publications/DBS/PDFFiles/07sr101.pdf. Doherty, Eric. 2008. Biodiesel. For the BC Sustainable Energy Association. Retrieved at: http://www.bcsea.org/learn/get-the-facts/renewable-energy-technologies/biodiesel. Rathmann, Regis. Szklo, Alexandre. Schaeffer, Roberto. 2010. Land use competition for production of food and liquid biofuels: An analysis of the arguments in the current debate. Renewable Energy. Vol 35:1. Retrieved from: http://www.sciencedirect.com/science/article/pii/S0960148109000974. Do biofuels deliver more energy than they take to grow? An answer to this oft asked question is complex. The subject is controversial, and even scientific research to analyze energy input and output is often charged with bias. Calculations are skewed by what factors are included or excluded, and by inconsistent methods of measuring the energy balance, or EROI. A study referenced by Julio de Castro reported an energy balance of 8.3 for sugarcane based ethanol, meaning that for every unit of fossil fuels used, 8.3 units of cane ethanol are produced. This is in stark contrast with corn ethanol, which, in the same study, was given a balance of 1.35. While much lower than that of cane ethanol, corn ethanol is still not as poorly balanced as gasoline, which requires 1.23 mJ of fossil fuels to create a single unit (1 mJ) of gasoline, giving it a negative balance. 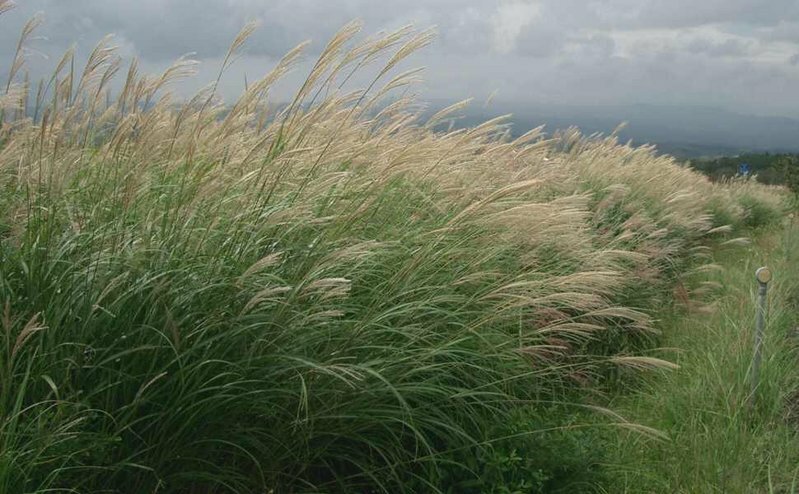 Switchgrass, the biological poster child of cellulosic feedstocks, was reported in a 2007 study to exhibit an energy balance of 5.4. Some studies have given it a slightly lower balance, though still a positive one. The energy balance "credentials" of switchgrass could mean a massive reversal from grain-derived feedstocks, to cellulosic ones. The emission of greenhouse gases from ethanol production and ethanol usage are interlinked with the debate on EROI, the energy balances. The results are controversial and highly variable due to differences in calculation methods. Ethanol contains carbon, thus, combustion of the fuel unavoidably emits carbon dioxide. That accounts for the actual burning of ethanol, but its production is responsible for emissions as well. The use of nitrogen based fertilizers, and the running of farm equipment and transport vehicles contribute to the overall fuel-cycle greenhouse gas emissions. Where biofuels that use plant materials, like corn, save on emissions, it is in their growth stage. Photosynthesis, the process by which plants transform the sun's light into energy, requires the absorption of carbon dioxide. Thus, the growth cycle of the feedstocks can serve as a carbon sink. Essentially, only as much CO2 is released as is absorbed, resulting in a nearly closed CO2 cycle. Ethanol is a practical alternative energy source that can be used in vehicles right now and which both lowers total GHG emissions and combats smog. Ethanol is a practical alternative energy source that can be used in vehicles right now and which both lowers total GHG emissions and combats smog. If Canadians are going to succeed in mitigating climate change, we are going to have to develop transportation fuels that don't generate large GHG emissions. Ethanol is one solution where the technology to produce it is immediately available. One study, cited by Yacobucci, stated overall fuel-cycle greenhouse gas emissions from corn based E10 are about 1% lower than gasoline. The same study gave E85 an about 20% fewer GHG emissions. Natural resources Canada notes that grain-based ethanol can reduce greenhouse gas emissions by as much as 40% on a lifecycle basis. It is unavoidable that these studies are highly variable in their results, making a clear reduction rate difficult to obtain. Often the results are influenced by the bias of the person conducting the research. Results for biodiesel are also mixed. The majority of studies have found net reductions in emissions for biodiesel, though some have expressed significant emissions increases. Natural Resources Canada says biodiesel can reduce emissions by up to 60%. A 2009 study found reductions of 35-60%, acknowledging the same possibility that biodiesel could reduce emissions by 60%. It is important to consider the realistic ranges and to not solely report the greatest amount possible, as those numbers are seldom reached. A common theme amidst all the disagreement on emissions and energy balances, is that, as the Worldwatch Institute says, "The viability of biofuels as low-carbon replacements for oil depends less upon the amount of energy required in production, than upon the type of energy used." The difference in emissions around the production of corn-based ethanol, for instance, can be huge depending on whether nitrogen fertilizers or manure is used, as well as if transport vehicles are run on gasoline or on biofuel. Making biofuels work is not a simple process. It involves careful choice in feedstocks and thoughtful planning of biofuel infrastructure. If employed wisely, biofuels can offer a significant contribution to mitigating climate change. Cherubini, F., N. D. Bird, A. Cowie, G. Jungmeier, B. Schlamadinger, S. Woess-Gallasch. 2009. Resources, Conservation and Recycling. Vol 53: 8. P 434-447. Retrieved at: http://www.sciencedirect.com/science/article/pii/S0921344909000500#secx19. Globally, the dominant biofuel is ethanol, followed by biodiesel. Biogas is emerging as significant as well, particularly in Europe. In 2010, 85 billion litres of ethanol and 15 billion litres of biodiesel were produced globally. Collectively, this made biofuel production worth 13.3% of the world energy mix; accounting for almost three times more energy than all of the other renewable energies combined. Traditional biofuels are primarily used in the poorest nations for heating and cooking. Modern transport biofuels still only account for less than a half of a percent of all the energy used in the world for all purposes. Fuel ethanol production is concentrated in Brazil, where it is concocted from cane sugar, and in the US where it is made primarily from corn. Together, the US and Brazil account for nearly 90% of global ethanol production. Canada, China and Europe make up the final 10%. Biodiesel is significant in Europe where it is created using rapeseed (canola) oil, and in the US and Argentina where it is produced mainly with soybean oil. Biodiesel in Canada is generally made from used cooking oil and animal fat, though a move towards the use of canola and soybean oil is anticipated. Approximately 15% of global corn production, or 5.7% of total global grain production is devoted to ethanol production. Around 10% of global vegetable oil production is destined for biodiesel production. How does this affect global food scarcity? As the demand for crops like corn and canola increases, pressure is increased upon an already stressed sector -- food production. With feedstocks doubling as food crops, the risk for competition between food and fuel has become a contentious ethical dilemma. After a period of massive reductions in real grain prices (53% between 1975/76 and 2000/01) a 2007/08 spike startled countries around the world. From January 2004 to May 2008, the global price of wheat shot up 108%, rice 224%, corn 88% and soybeans 53%. No consensus on the cause of this surge has been reached; however, ethanol production may have been a factor through its increasing demand. The timing of the spike certainly coincided with an expansion in ethanol production, though other factors, such as hoarding, export bans and panic buying by governments, must be considered in the prognosis as well. Studies suggest a 20-40% increase in corn prices attributable to biofuel expansion. The rapid growth in ethanol production does raise concerns that price increases for grains could continue to grow at this rate or possibly even higher. For this reason, biofuels from non-food sources have gained much attention in the past several years. Second and third generation biofuels use feedstocks such as algae and waste biomass, thereby eliminating reliance on food crops. Unfortunately, the easiest feedstocks to convert are still the ones we eat. Non-food sources demand energy-intensive processing, and opponents of biofuel expansion claim they use more energy than they put out. Daynard, Karen. ,Daynard, Terry. 2011.What are the effects of biofuels and bioproducts on the environment, crop and food prices and world hunger? KD Communications. Retrieved at: http://gfo.ca/LinkClick.aspx?fileticket=HKfOeU3cHTI%3d&tabid=793. In 2010, Canada's production was 1.83 billion litres of fuel ethanol and 110 million litres of biodiesel. Recent regulations (5% renewable fuel content in gasoline, and 2% in diesel and heating oil) have been presented by the federal government as a scheme that could reduce Canada's annual GHG emissions by four million tonnes. Canadian ethanol is derived mainly from corn, but also from wheat in Western Canada. Ethanol production competes with the livestock industry for the millions of tonnes of Canadian corn produced annually. In 2006, 7% of the 9 million tonnes of corn produced went to ethanol production; with most of the remainder becoming livestock feed. For wheat less than 1% of the 20 million tonnes that was produced in that same year went to ethanol while the rest was exported. Despite having the raw resources for ethanol production, the priority on livestock feed and export leaves Canada importing biofuels. Canada imported 100 million litres of ethanol from the United States in 2006. Canada is seen as a prime location for cellulosic feedstock production, with its vast forest and agricultural resources. At present, Ottawa hosts the only cellulosic demonstration plant in Canada, though more are anticipated. $500 million came from the government of Canada to support the Next-Generation Biofuels Fund, which will focus efforts on large-scale demonstration projects for next-generation biofuels. 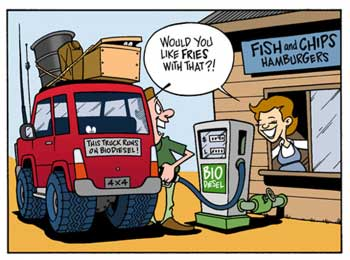 Biodiesel is made mostly from used cooking oil and animal fats that would otherwise go to waste. Biodiesel is also produced from sources such as canola, Canada's dominant vegetable oil. A recent mandate for 2% renewable content in all diesel fuel and heating oil was announced by the federal government, which added to a 5% mandate for renewable fuel in gasoline. Canada will have to increase its annual production of biodiesel from 200 million litres to about 550 million litres to meet the new government standards. 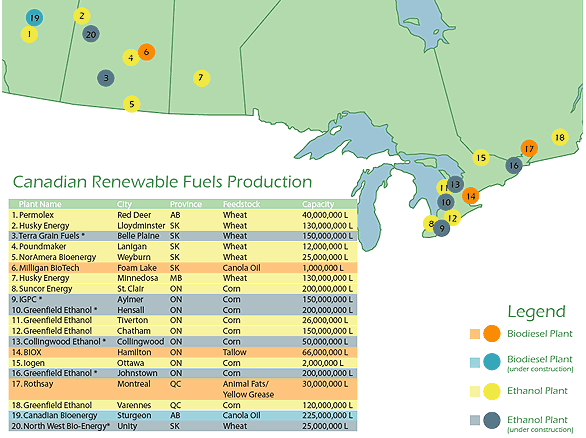 Biofuel plants in Canada, concentrated in Canada's industrial heartland and the prairies. E5, a blend of 5% ethanol, is sold in Ontario, E7.5 in Saskatchewan, and E8.5 in Manitoba. The Asia-Pacific Economic Cooperation (APEC) noted in 2008 that about 1,000 Canadian service stations offered ethanol blends ranging from 5-10%. Getting more ethanol-heavy fuel mixes will be difficult when there are still so fewFlex-fuel vehicles (FFVs). E85 is used to fuel the vehicle fleet of Natural Resources Canada, but there are few such vehicles elsewhere. Likewise, biodiesel is used by government vehicle fleets, though in very low blends. British Columbia has an abundance of natural biomass resources, including sawmill residues, mountain pine beetle affected timber, logging debris, and agricultural and municipal wastes. To enhance B.C. 's leadership role and help meet the province's electricity needs for clean, renewable power, the Department of Energy, Mines, and Petroleum Resources initiated a new Bioenergy Strategy. The strategy sets ambitious goals for the adoption of cellulosic feedstocks for electricity production. In 2007, BC produced upwards of 900,000 tonnes of wood pellets, 90% of which were destined for overseas thermal power plants. B.C. 's several biomass power plants can be found on our Electricity Sources Map. The British Columbia wood pellet industry demonstrates a substantial contribution to the European Union market for bioenergy feedstock. In 2007, BC produced upwards of 900,000 tonnes of wood pellets, 90% of which were destined for overseas thermal power plants. The majority of the BC Bionergy Strategy depends on advances in cellulosic conversion technology. Currently, the fibrous cellulose in plant material demands processes that are not yet cost-competitive with first generation feedstocks, like corn. By 2020, it aims for the province's biofuel production to meet 50 per cent or more of the province's renewable fuel requirements, in support of general goals to reduce transportation sector greenhouse gas emissions. Another goal is to develop at least 10 community energy projects that convert local biomass into energy. Alberta Agriculture Food and Rural Development. ‘Understanding commercial opportunities in the biogas sector in Canada.’ Goodfellow Agricola Consultants Inc (2006). Accessed June 5, 2012. Asia-Pacific Economic Cooperation (APEC). 'Summary of APEC Biofuels Activities.' Last modified July 21, 2008. Accessed May 31, 2012. Avery, Dennis. 'Biofuels, Food, or Wildlife? The massive land costs of U.S. Ethanol.' September 21, 2006. p.6. Accessed May 30, 2012. Province of British Columbia. BC Bioenergy Strategy.(2010). Accessed May 30, 2012. Boyd, Mike. Murray-Hill, Anita. Schaddelee, Kees. Biodiesel in British Columbia: Feasibility Study Report. Prepared by: WISE Energy CO-OP for Eco-Literacy Canada (2004). Bringezu, S., H. Schutz, M. O'Brien, L. Kauppi, R. Howarth, J. McNeely. Assessing Biofuels. United Nations Environment Programme. (2009). Accessed June 5, 2012. Canadian Renewable Fuels Association. ‘Biodiesel.’ Copyright 2012. Accessed May 31, 2012. Capital Regional District. 'Landfill gas-to-electricity plant.' Accessed May 31, 2012. Daynard, Karen. ,Daynard, Terry. What are the effects of biofuels and bioproducts on the environment, crop and food prices and world hunger? April, 2011. KD Communications. Accessed May 31, 2012. De Castro, Julio. ‘Biofuels -- An overview.’ (2007). Accessed May 31, 2012. Doherty, Eric. 2008. Biodiesel. For the BC Sustainable Energy Association. Elobeid, Amani. Hart, Chad. Ethanol expansion in the food versus fuel debate: How will developing countries fare? Journal of Agriculture & Food Industrial Organization. Vol 5 (2007) Special Issue. Accessed June 5, 2012. House, Harold. ‘Alternative energy sources -- biogas production.’ London Swine Conference -- Today's Challenges... Tomorrow's Opportunities. Ontario Ministry of Agriculture, Food, and Rural Affairs. April 3-4 2007. Accessed May 31, 2012. National Corn Growers Association. ‘Ethanol Facts.’ (2008). Accessed August, 2011. Natural Resources Canada. ‘Next-generation biofuels.’ Alternative Fuel Facts. Last modified August 16, 2010. Accessed May 30, 2012. Rathmann, Regis. Szklo, Alexandre. Schaeffer, Roberto. 2010. Land use competition for production of food and liquid biofuels: An analysis of the arguments in the current debate. Renewable Energy. Vol 35:1. Schmer, M.R., K.P. Vogel, R.B. Mitchell, R.K. Perrin. ‘Net energy of cellulosic ethanol from switchgrass.’ Proceedings of the National Academy of Sciences of the United States of America. Vol. 105 (2008). Accessed May 31, 2012. Sissine, F. ‘Renewable Energy: Background and Issues for the 110th Congress.’ Ch 1. ‘Ethanol and Biofuels Production, Standards and Potential.’ Ed. W. Leland. Nova Science Publishers. New York (2009). Soetaert, W., E. Vandamme. ‘Biofuels.’ John Wiley & Sons, Ltd. UK (2009). Steenblink, Ronald. ‘Biofuels -- At what cost?’ Global Subsidies Initiative. Geneva, Switzerland (2007). Accessed May 31, 2012. Taylor, S. ‘Canada proposes July 1 start for biodiesel rule.’ Reuters. Ed. Frank McGurty. Posted Feb 10, 2011. Accessed May 31, 2012. Tokgoz, S., A. Elobeid, J. Fabiosa, D. Hayes, B. Babcock, T. Yu, F. Dong, C. Hart, J. Beghin. ‘Emerging biofuels: Outlook of effects on U.S. grain, oilseed, and livestock markets.’ Staff Report 07-SR-101, Center for Agricultural and Rural Development, Iowa State University. Ames, Iowa (2007). Accessed May 31, 2012. U.S. Department of Energy. ‘Ethanol. Energy Efficiency & Renewable Energy.’ U.S. Environmental Protection Agency. Last modified May 30, 2012. Accessed May 31, 2012. Worldwatch Institute. ‘Biofuels for Transport: Global Potential and Implications for Energy and Agriculture.’ Prepared by Worldwatch Institute for the German Ministry of Food, Agriculture and Consumer Protection in coordination with the German Agency for Technical Cooperation and the German Agency of Renewable Resources. Earthscan. London (2006). Accessed May 30, 2012. Yacobucci, B. ‘Fuel Ethanol: Background and Public Policy Issues.’ Ch 2. Ethanol and Biofuels Production, Standards and Potential. Ed. W. Leland. Nova Science Publishers. New York (2009).